Nothing looks like it! Nothing cooks like it! 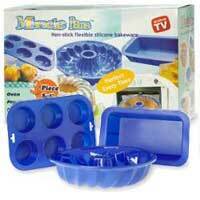 Miracle Pans are made of flexible silicone and can withstand extremes of temperature, from -40 to 500 degrees Fahrenheit. Use in the oven, the microwave, or the freezer! Can be folded and stored in drawers! Cooks evenly and completely, and stops cooking immediately when removed from the oven! No burnt edges or crusts. Non-stick, quick release, and dishwasher safe! Go from the freezer, to the oven, to the microwave.